A rare tour of Utah's expansive and secretive Army testing facility. A cylindrical tunnel in the Active Standoff Chamber at Dugway Proving Ground. In Utah's West Desert, toxic chemicals are stored beyond a double-locked door inside a fortified lab. The lab, surrounded by a razor wire fence, is on the Dugway Proving Ground, an 800,ooo-acre U.S. Army testing site. Roughly the size of Rhode Island, the complex lies in a sea of sagebrush and cheatgrass about 90 miles southwest of Salt Lake City where pronghorn antelope and wild mustangs are known to graze. Dugway opened in 1942, giving the military a place to test chemical and biological weapons in the remote desert. In its 75-year history, the testing site has endured its share of controversy. In the '60s, for example, the death of thousands of sheep were linked to Dugway. And as recently as 2015, the Army mistakenly mailed live anthrax samples to dozens of laboratories in the U.S. and abroad. Conspiracy junkies point to the site's insulation—particularly the secretive Michael Army Airfield—as evidence that the government is hiding something extraordinary; outer space aliens seems to be the preferred theory. For the Army and its contractors, the site is home to a meteorological lab, a small town with a school, a community center that screens movies and a Subway restaurant. Drone pilots train in its unrestricted airspace. Then there's the section of the site that tests biological and chemical defense and detection equipment. The first line of defense is forged in a chemical lab. The horror of a chemical attack was highlighted this year, when ghastly video footage showing the victims of a purported chemical attack in Syria surfaced. In the hyper-controlled lab, chemicals are used to test the efficacy of life-saving gear such as face masks. To determine whether a particular piece of equipment is going to perform the way it's intended, the Army subjects each item type to rigorous testing. "We don't take the manufacturer's word that their mask is going to do all that the manufacturer says it is. That needs to be proven out," test officer Andrew Neafsey says, hence the "proving ground" name. Neafsey works on the lab's Smartman program, which entails a hollowed zinc bust inside a glass case that serves as a chemical test dummy. From Smartman's mouth, air is pumped through an artificial esophagus hose. 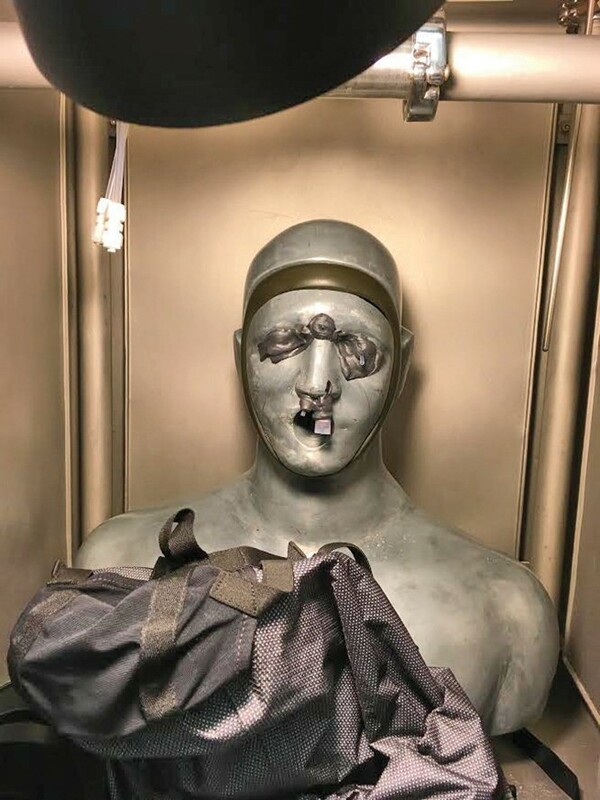 "One of the main operationally relevant aspects to the Smartman test is that the masks respire, or breathe, while they're being tested," Neafsey says. On a recent tour, the lab is preparing to test a mask's resistance to a blistering and noxious mustard agent known as HD. The face has test tubes sticking out from two sample locations in the nostril and eye socket. In mask testing, the Army determines how well it will protect against chemical vapor. The Smartman system challenges it with vapor and liquid, then scientists measure what is able to penetrate to the the mask's interior. Dave Rose is one of the scientists tasked with preparing Smartman. Smartman test dummy being prepped for chemical testing. "The chemical agents are stored under a security system and no one person has access to them," he says. "There's always got to be at least two. We have different locks and keys and combinations to get them out." Safeguarding themselves with masks, rubber smocks and gloves, a pair of scientists will retrieve the desired chemical and load it into a programmable syringe that doles out drops. Tests typically run for 24 hours. By that time, most of the agent has evaporated. The entire building is designed so that the air pressure flows from the outer portion inward toward the Smartman testing rooms, and then is sucked upward through carbon and HEPA filters on the roof. While testing equipment in a "chem-lab" is controlled and confined, "the battlefield is huge," says Gary Millar, engineer branch chief in the test support division. To get a better sense of how chemicals would function in combat, Dugway runs tests inside two spacious dissemination warehouse buildings, the Active Standoff Chamber and the Joint Ambient Breeze Tunnel. Millar sees these testing centers as a continuation of the chemical lab. The Smartman test, he says, is one step in a grand testing system, the likes of which exist only in Utah. The Active Standoff Chamber (ASC) and Joint Ambient Breeze Tunnel (JABT) allow the Army to take what they've learned from the lab, then simulate chemical clouds in an open area to observe how that might alter defense and detection equipment. "When you get out to the field, you've got wind blowing, you've got grass, you've got dust in the air," he says. "That affects what gets detected and you need to understand all that." When it's not being utilized for testing, the ASC Chamber—a 360 grade stainless steel rectangular box—is empty save for several white fans. At each end, cylindrical tunnels large enough to walk through protrude outward. The floor is made of 4-inch steel slats, covering an airflow cavity underneath. The entire contraption is inside a warehouse room with exhaust pipes that lead outside to a massive bank of carbon and HEPA filters that block simulants from spilling out into the air. Because ASC and JABT aren't controlled to the degree the Smartman test is, officers who run tests in these two facilities don't use chemical agents, but rather simulant substitutes. These simulants allow the researchers to document how equipment and detectors stand up in an environment that is both unrestricted, yet contained. The base utilizes LiDAR technology—a light beam shot into the distance that scatters when it hits a chemical or biological agent. "From that you detect, yes, there is a chemical agent out there and—as accurate as your system can be—what the concentration is," Millar says. The JABT is a larger and more barren warehouse with an adjustable ceiling where Dugway conducts simulant tests. Dugway will implement a new electronic test system at the beginning of next year. The system reads sensors out in a testing field and consolidates the data in a single management system. Information gathered from electronic equipment is funneled through a computer system that timestamps and logs the figures, and stores the data in one location. The computerized system also produces a map where analysts can view a field test in real time and adjust it swiftly. Improving the tests, Millar says, is essential to ensure that, if the worst were to happen, soldiers have equipment that will protect their lungs and eyes and detection devices that alert them to danger. "Everything we do here is for the war fighters," he says. "Should our folks have to get out in the field somewhere, they have the proper equipment to protect them to the maximum extent possible." Engineer Branch Chief Gary Millar stands in the Joint Ambient Breeze Tunnel.